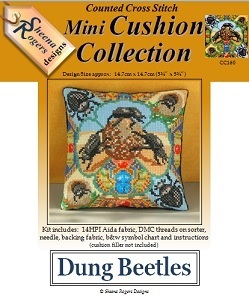 The industrious Dung Beetle is honoured here with its very own mini cushion! The Ancient Egyptians admired these little creatures, even portraying them in jewelled amulets which have been re-created in this design, as they served such an important purpose of removing the piles of you-know-what, else we would be up to our necks in it by now! Also featured are the Beetles rolling a ball of dung, plus some baby Beetles burrowing their way out of the dung balls they were hatched in. An unusual topic for a cross stitch design, yes, but it's sure to be a conversation piece in any home. Only whole cross stitch is required to stitch this design (so no fractionals or backstitch needed).